Educational concert experience featuring two American icons: Joseph Campbell & Louis Armstrong, as performed by the Louis Armstrong Society jazz band. Bliss...And All That Jazz is a concert that features the Louis Armstrong Society Jazz Band performing the music of Joseph Campbell as he would have played it in his day, in a tribute to both the history and legacy of Joe. Few followers of Campbell know that he played saxophone in his college days at Columbia University, about the same time Louis Armstrong was making his way up to Chicago and New York helping to form the genre that would come to be known around the world as "jazz." Bliss...and All That Jazz presents these two major figures as parallel American heroes and weave their narratives, histories, and stories through a variety of songs that will recreate the songs played by Campbell and Armstrong. 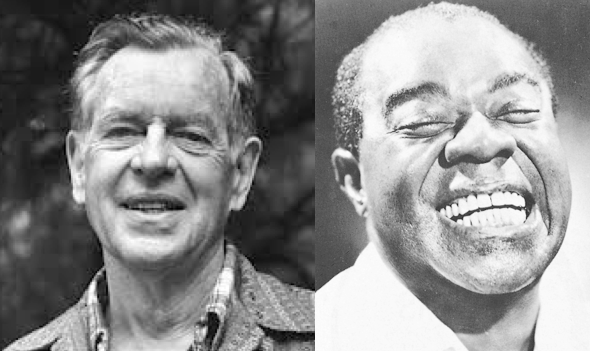 Joseph Campbell (left) and Louis Armstrong (right). Two men who changed American history, genuinely enjoyed life, and loved jazz music. Educational segments are interspersed throughout the concert in a fluid narrative, so that the show is informative and educational without becoming didactical, and approaches both the philosophies of Campbell's mythology and Armstrong's jazz in accessible, fun manner, showing by the end that the two approaches are actually one. By the end of the evening, jazz enthusiasts, Campbell fans, and followers of bliss everywhere will have a better understanding of these these two legends who both concluded: "What a Wonderful World." Joseph Campbell as a young man. 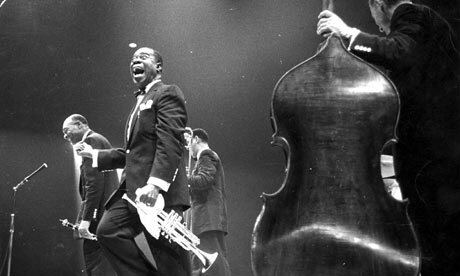 Joseph Campbell and Louis Armstrong....a seemingly unlikely pair. But these two American icons, or ‘heroes,’ if you will, had a great deal in common. Both men lived their lives dedicated to the pursuit of their passion. Both men knew the value of improvisation, of going against the grain, of the joys of inventing new genres and challenging traditional approaches while still honoring their personal and collective past. Above all, these two men were united by a love, a dedication, and a timeless appreciation of jazz music. While Louis grew up on the streets of New Orleans, in and out of “Boys Homes” (what today we would essentially call juvenile prison), Joe came of age in a relatively upper-middle class family. Joe’s youth was filled with travels, adventure, and studying (even as a young boy, he had an affinity for Native American myths and had read every mythology book in the public library by a very young age), while Louis sold coal and newspapers in the Red Light District of New Orleans to make enough money to support and feed his mother and sister. But these two men shared an unwavering commitment to that which made them happy - the philosophy of “Follow your bliss,” which Joe would later be known for. Louis was given his first instrument out of charity by a wealthy family that had taken Louis under their wing. Louis began playing trumpet at the age of 12 years old....and simply never stopped. His talents as a musician eventually brought him to Chicago, to join Joe “King” Oliver’s Jazz Band. Louis came of age right at the cusp of a new musical genre....and as the music evolved from ragtime to jazz, Louis followed (and helped to define) that new music all the way up the Mississippi River. Louis would later be known not only as one of the best trumpet players to ever live (he used to compete in ‘contests’ within the band, and is the only trumpet player to record 42 high C’s followed by a high E flat in the tune, “Swing That Music”). As he became better and better, his name become known around the world. Louis went on to play for presidents, European royalty, in motion pictures, and all across the U.S. for the rest of his adult life. Living out his own “hero’s journey,” Louis never seemed to fear the unknown or shy away from the call to adventure. Joe went on to have an extremely successful career in academia, creating the genre of mythological studies in the same way Louis helped to create the genre of jazz music. While people had dabbled in it before, it was Joe’s defining texts (beginning with Hero With a Thousand Faces) that began to create the world of mythology as a potential place for serious academic study. The band features 4 saxophones, 2 trumpets, 1 trombone, piano/conductor, bass/tuba, drums, guitar, female vocal, male vocal, and a narrator. Today, Joe’s work is preserved by the Joseph Campbell Foundation, an organization dedicated to preserving and protecting Joe’s work in the same way the Louis Armstrong Society seeks to preserve the legacy of Satchmo. The Bliss...And All That Jazz CD was created as a bridge between these two groups so that the world may prosper from the outcome. Dedicated to lovers of myth, supporters of the arts, academics, musicians, and followers of bliss everywhere....we are proud to present the first ever Joseph Campbell and Louis Armstrong CD.